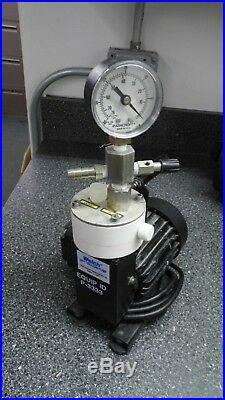 WELCH 2010B-01 SINGLE STAGE CHEMICAL DUTY VACUUM PUMP. WELCH 2010B-01 SINGLE STAGE CHEMICAL DUTY VACUUM PUMP VOLTAGE : 115 VAC FREQUENCY : 60 Hz CURRENT : 0.9 AMPS POWER : 43 WATTS SPEED : 3300 RPM CAPACITOR : 12µF/200V MAX VACUUM : 26.7 Hg MAX CONTINUOUS PRESSURE : 5 PSIG. Additional pictures and information are available upon request. All items that have been listed, have not been tested, unless otherwise stated. Our goal is to provide the purchaser with as much information as possible. Our feedback is left in reciprocation to buyers feedback. The item "WELCH 2010B-01 SINGLE STAGE CHEMICAL DUTY VACUUM PUMP" is in sale since Wednesday, November 7, 2018. This item is in the category "Business & Industrial\Hydraulics, Pneumatics, Pumps & Plumbing\Pumps & Pump Accessories\Vacuum Pumps\Other Vacuum Pumps". 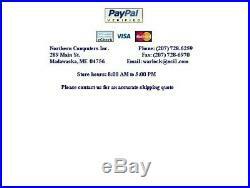 The seller is "nci-sales" and is located in Madawaska, Maine. This item can be shipped to United States, Canada.